Post news Report RSS	Alpha 0.5.8 released! Alpha 0.5.8 released. Important features: new EU based server, server REST API service, achievements, metrics expansion, and an achievements / statistics UI. Alpha 0.5.8 released. Important features: server REST API service, achievements, metrics expansion, and an achievements / statistics UI. 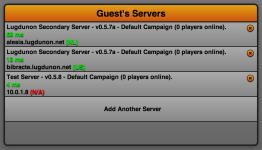 The Lugdunon server at alpha.lugdunon.net has now been replaced with alesia.lugdunon.net. This new server is located in the EU (the Netherlands to be exact) and will hopefully mitigate some of the latency / load time issues the EU players were experiencing. The server listing now also reports the server location to the right of the server address. In the event that a location cannot be determined (local intranet ip, etc) "N/A" is displayed. A new extendable REST service is now available in the server code base. This will allow modders to expose various aspects of the game state to the client or other consumers. Currently the system is used to serve up players' recorded metrics and achievement data. Achievements have finally made it to Lugdunon. When your character performs an action that meets certain criteria, you will be awarded with an achievement. 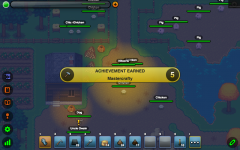 Achievements award points based upon their difficulty or rarity. 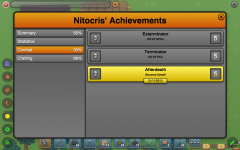 Achievements / achievement points currently exist only to give the player a sense of accomplishment, however this will be expanded upon in the future to reward the player with items, advancements, and other perks. 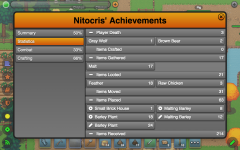 Players can view their character's achievements and accumulated metrics (statistics) via a new UI dialog. 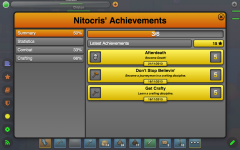 The initial panel shown is the summary panel, which displays your current progress, points awarded, as well as the 5 most recently earned achievements. 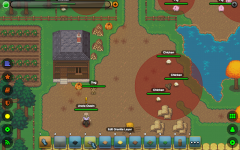 Players can also view their accumulated metrics by selecting the "Statistics" option. This will show various statistics on actions your current character has performed. Finally, players can view their earned and unearned achievement progress, separated into categories, by selecting the corresponding category. The font used to render certain icons and UI elements was updated to a cleaner, richer icon set. A "wait" dialog with a customizable title was added to the client-side API. This dialog is intended for use when an action must be performed on the client that has an unknown duration. Currently, certain new style information is not picked on the initial load of the client, if you have played a previous version. This will cause certain elements, most notably the new icons, to render improperly. This issue should rectify itself if you reload the client. The full change log for 0.5.8 is available here. Hah! There aren't too many as of yet, so you should be safe for a bit.